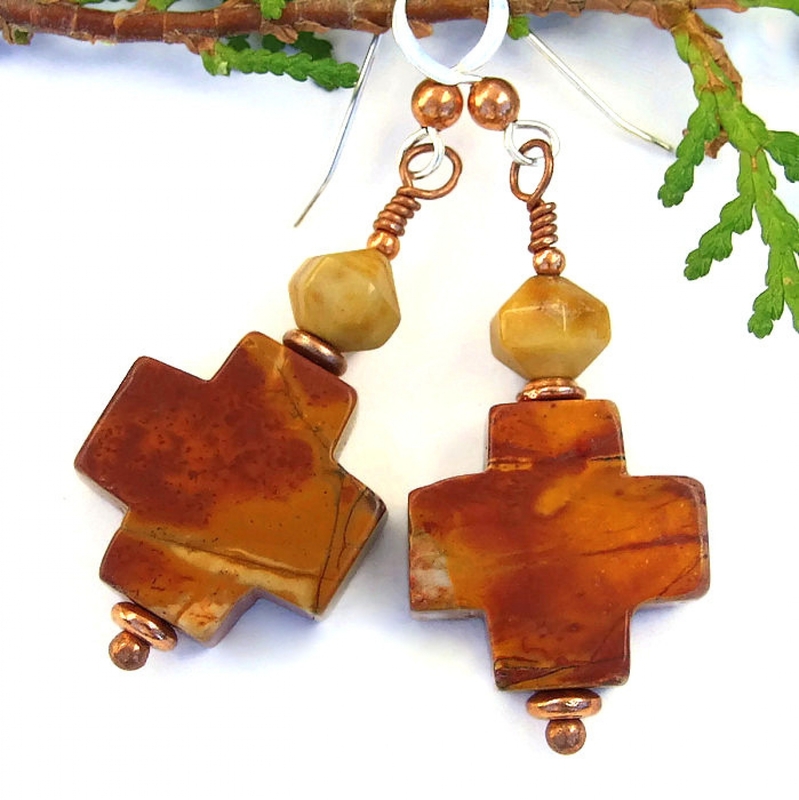 Evoking the soul satisfying, earthy colors of the Desert Southwest, the LAS CRUCES handmade gemstone earrings will be a stunning addition to the collection of a woman who loves Christian cross jewelry. Created with red creek jasper crosses, American picture jasper lantern beads, copper and sterling silver, each cross is lovely no matter which side is hanging in front. Just imagine these beauties hanging from your ears - eye catching and definite conversation starters. 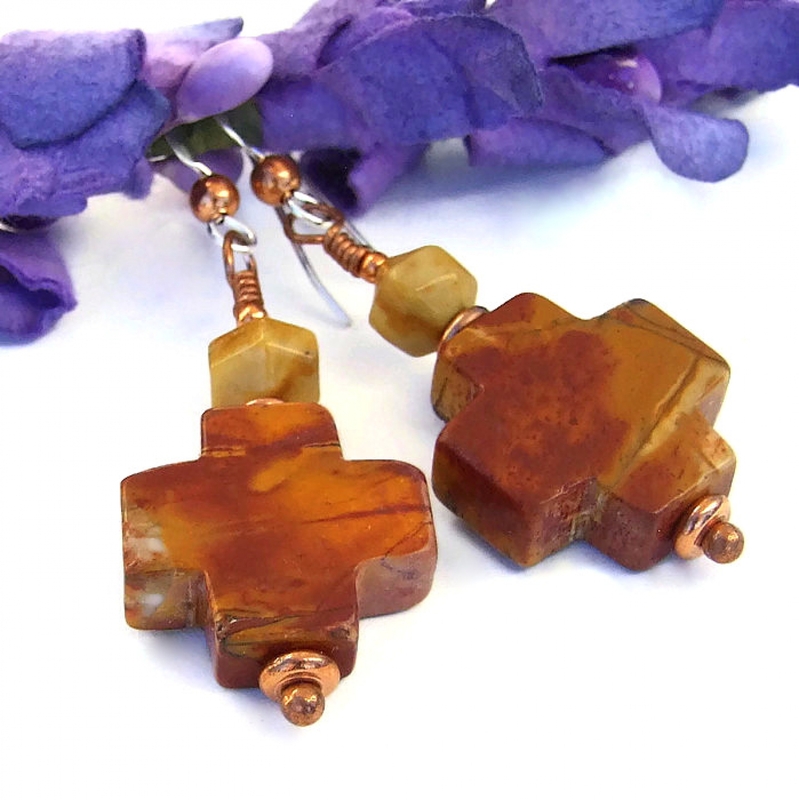 The LAS CRUCES cross earrings were carefully designed and handmade by Catherine of Shadow Dog Designs. “Las Cruces” is Spanish for “the crosses” and is the name of a favorite city in New Mexico. 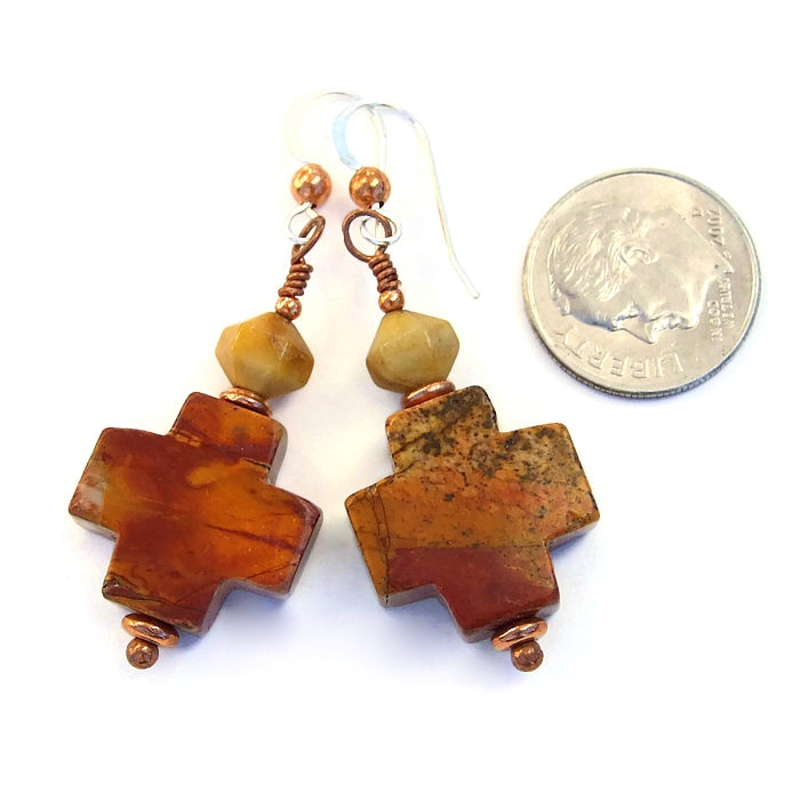 As you can see from the photos, the colors of the red creek jasper crosses used in the LAS CRUCES earrings are so reminiscent of the colors of the Desert Southwest, especially the striations of Red Rock Canyon near Las Vegas. Shades of brick red, mustard yellow and light tan can be found swirling on the front, back and sides of each cross. Small specks of dark brown and black also dot a few areas of the crosses. A copper disc spacer was placed above and below each cross. An interesting tidbit: red creek jasper is found in only one place in the world, near a creek in China; the Chinese name of the stream translates to "red creek." To continue with the Southwest flavor, American picture jasper in an unusual lantern shape was placed above each cross. The gemstones are thicker in the middle, faceted into six distinct planes. The color is a rich medium beige with a bit of darker shading here and there. A 2mm copper bead was placed above each jasper lantern. 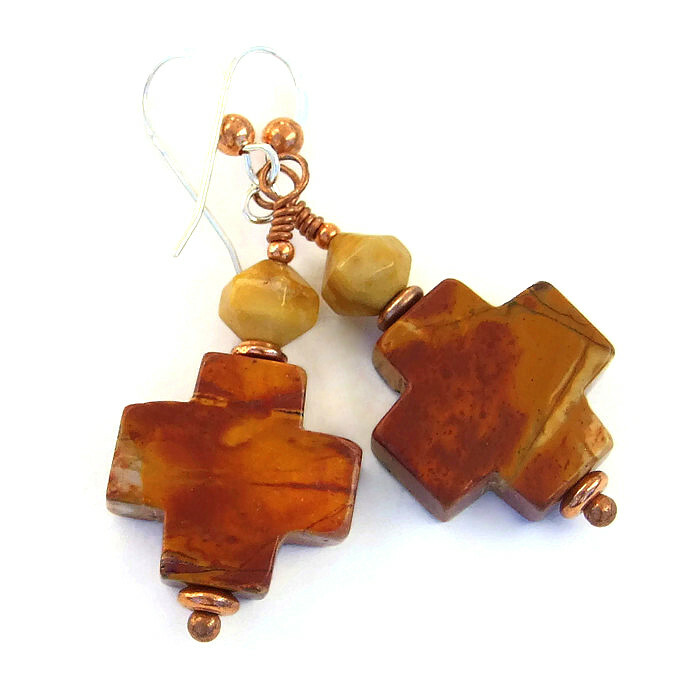 All the elements used to create the LAS CRUCES earrings were strung on a copper head pin with a round ball at the end. The top of each headpin was carefully wire wrapped into a loop and connected to sterling silver French hook earwires. 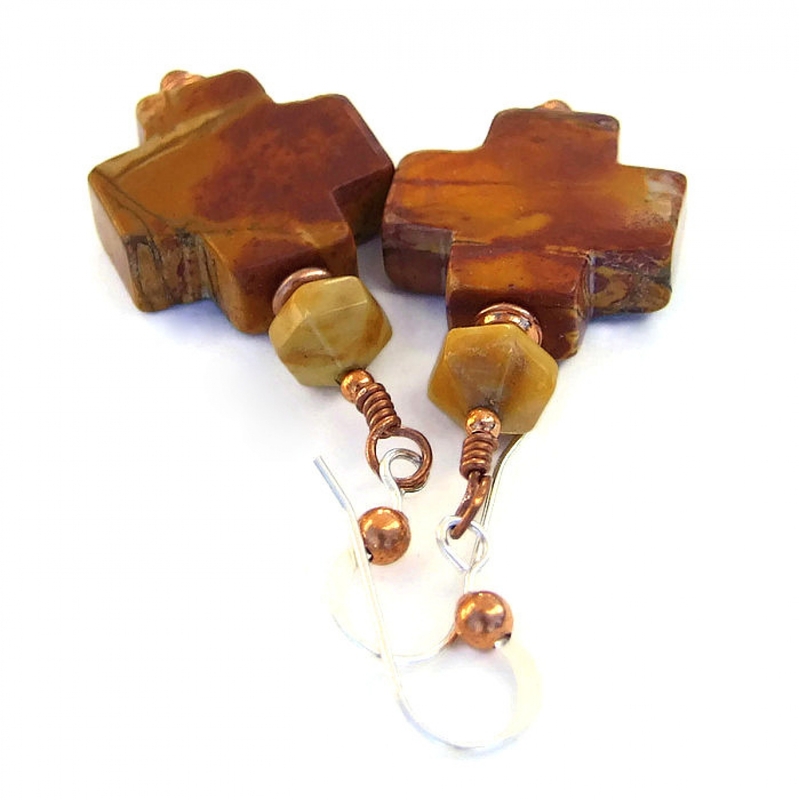 A 3 m copper bead was added to each earwire to complement the copper used in the main body of the earrings. For a better understanding of the relative size of the LAS CRUCES cross earrings, please be sure to check out photo #5 for a size comparison with a dime. Red Creek Jasper is said to be a stone of protection and grounding and helps gives the wearer the courage to speak out for things they believe in. American Picture Jasper is said to be a stone of harmony and helps with the re-evaluation of life’s issues. Copper is said to allow the wearer to recognize barriers in the path of personal development. Silver is a metal of love and healing; it is a mirror to the soul, helping us to see ourselves as others see us. 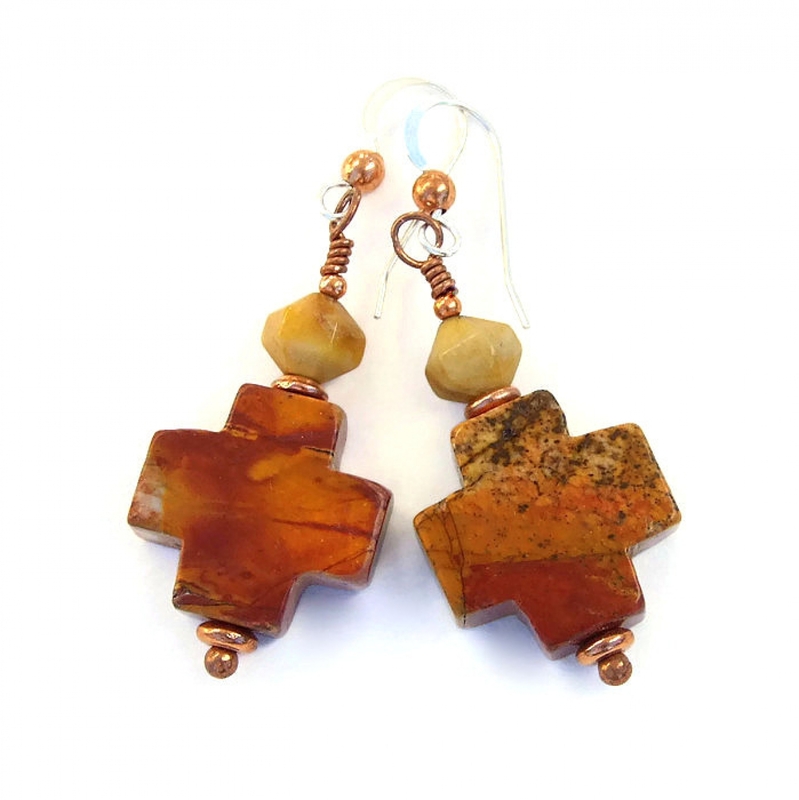 The LAS CRUCES gemstone cross earrings will be carefully packed in an organza jewelry bag, perfect for gift giving to a loved one . . . or to yourself!